Chopsticks is a wonderful example of a fun, playful story with a word count well under 500 words. I’d read this book again to study the structure of the story and how it leads the reader on to the next page. This is another great example of how a simple idea can turn into an entertaining story. The word play was a lot of fun and added another level to the story. I also admired how the illustrations were integral to the story, creating emotion that just wouldn’t be there in the text alone. Young children often don’t understand that it’s okay for a friend to do something else or play with someone else sometimes, and this book would be a good one for beginning that discussion. I would also use this to talk about “chopsticks”, what they are and maybe do a graph on how many kids have used chopsticks. It would be fun to bring in real chopsticks and have students try using them. 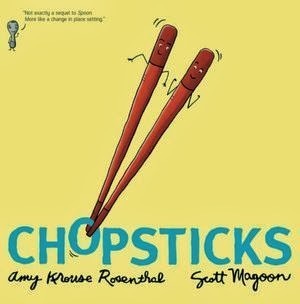 They could write their own stories or writing journal entries about other things chopsticks could do—either alone or together, or create a chopsticks poster with pictures of chopsticks together and chopsticks apart. I recently attended the Packaging Your Imagination Conference put on by CANSCAIP (Canadian Society of Childrens Authors, Illustrators and Performers). I’m so grateful to my Debbie Ridpath Ohi of MiG Writers, who suggested I attend. I also attended an industry panel moderated by Evan Munday, author of The Dead Kid Detective Agency, featuring executive editor Hadley Dyer from Harper Collins Canada, agent Monica Pacheco of Anne McDermid & Associates, Yvette Ghione, editorial director at Kids Can Press, and bookseller Heather Kuipers of Ella Minnow Books in Toronto (YoYoMama has a great review of Ella Minnow Books if you want to know more about it). They all emphasized how important it is to submit the best work you can to editors or agents. A big mistake people make is submitting too soon. Another tip they had was about social media. If you are engaging in social media, on Twitter, blogging or whatever, make sure you do it well by updating content frequently -- or don’t do it at all. For example, a bad book trailer can be worse than not having one. The keynote address by Linda Bailey, author of Stanley’s Party and the recent Toads on Toast as well as many other books, reminded me how important it is to take risks in writing and in the process of getting published. You need to be open to change (especially because of the way the industry is changing so quickly) and not be afraid to try something new. I'd be leaving out something really important if I didn't mention how much I enjoyed the illustrators exhibit that was also part of this conference. I loved the opportunity to see original artwork from picture books, including work by Barbara Reid, an original illustration from Phoebe Gilman's Something From Nothing, work by Bill Slavin, process illustrations from Debbie Ridpath Ohi's work on I'm Bored and many more. The exhibit is on display at the Humber College L-Space gallery until December 10th, so I'm going to try to take my daughter to see it before it closes. I really wish the gallery had some evening or weekend hours (M-F, 12-5)! The best part of going to a conference is how I always come home charged up and excited about writing, ready to get back to work. I really enjoyed meeting some new people and hearing about their writing or illustrating experiences. I’ll definitely be going back next year! Eldritch Manor is a retirement home for some very strange beings indeed. All have stories to tell — and petty grievances with one another and the world at large. Storm clouds are on the horizon, however, and when Miss Trang departs on urgent business, Willa is left to babysit the cantankerous bunch. Can she keep the oldsters in line, stitch up unraveling time, and repel an all-out attack from the forces of darkness ... all while keeping the nosy neighbours out of their business and uncovering a startling secret about her own past? The uniqueness of this story drew me in. I really liked the premise of the house full of older, fantastical creatures and the way elements of magic were woven into the story. I also liked the writing style and the way Willa’s curiosity led her to a job working inside the house. The characters all had interesting and different personalities and the story moved along at a good pace. I wished that Willa’s relationship with her mother was developed a little more, but maybe that will happen in the sequel. Overall, this charming but scary book was an entertaining read, especially if you like imaginary creatures (and battles with the dark side). Kim Thompson lives on Salt Spring Island in British Columbia, Canada. She is also a film-maker and television writer. 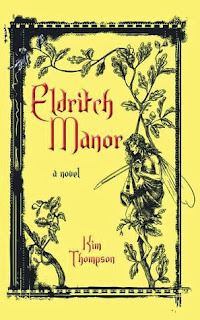 Eldritch Manor is Kim Thompson’s first published book. This book is nominated for the Ontario Library Association’s Forest of Reading for 2014 in the Silver Birch (Fiction) category. For more info, visit Kim Thompson’s website. I love libraries and playing all kinds of games so I was excited to read this book. I enjoyed all the references to books and television shows, and the mystery and the clues to finding the way out were a lot of fun to try to solve. The library in this book was full of interesting details, like star maps in the ceiling, sofas designed to look like Scrabble trays and holographic statues. This book explained some aspects of how to use a library in a fun way; for example, using the Dewey decimal system to find books and asking librarians for help. It was a fast-paced story with several different characters. As a writer, I’d look at this novel again to see how the author created the cool setting and dropped in details about it. But mostly, I’d read it again to revisit all the clever references to other books. Chris Grabenstein lives in New York City. He has several pets, including his amazing dog Fred, who starred in the movie Chitty Chitty Bang Bang. 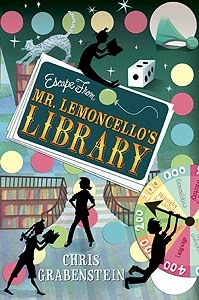 There is a game to go with this book called Mr. Lemoncello's Great Library Escape Game which is available for school libraries on his website. For more info, visit Chris Grabenstein’swebsite. Learning from Picture Books: I Dare You Not to Yawn! A yawn can land you in your pj’s and under the covers before you can blink and say "Baa baa black sheep." So clamp your mouth shut and look away from your sleepy dog, stay away from your cuddly blanket, and whatever you do, don’t think of baby orangutans stretching their long arms out for a snuggly hug. Otherwise, you might find your mouth opening wide and letting out a great big yawny yaaaaaawn -- hey, you were supposed hold it in! A hilarious read-aloud that is so much fun, kids will beg for it again and again, whatever the consequences. Just try to resist this comical -- and infectious -- cautionary fable that will have even bedtime-avoiders gladly snuggling up for a nightly challenge. This is perfect to read at bedtime. The comic-style illustrations in this story are a lot of fun. I enjoyed how the writer took a simple idea and drew it out into a story full of tips for how not to yawn. The carefully-chosen sounds words add to the enjoyment of the story. This book would be a good one for studying pacing and page turns. 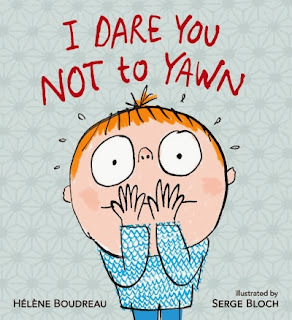 For more information on Helene Boudreau’s process for writing this book, check out this interview with Debbie Ridpath Ohi -- Picture Book Writing Process: How Hélène Boudreau Wrote I DARE YOU NOT TO YAWN (Candlewick Press). This book would be a nice one to read to preschoolers or kindergarten students to promote a love of reading. It gives you that wonderful cozy feeling of a shared experience. I can also imagine reading this to my class during an inquiry on the human body...or to spark an inquiry, since it so easily lends itself to questions about why we need to sleep or why we yawn. If you're looking for more good picture books to read or to use in your classroom, check out Susanna Leonard Hill’s wonderful list of resources, Perfect Picture Books as well as her blog feature Perfect Picture Book Fridays. This weekend I'll be attending the Packaging Your Imagination, a conference for writers, illustrators and performers taking place here in the Toronto area. This one-day conference is organized by The Canadian Society of Children's Authors, Illustrators and Performers (CANSCAIP). Although I've been a member of CANSCAIP in the past, I've never been to one of their conferences before. But my awesome critique partner, fellow MiG Writer Debbie Ridpath Ohi, reminded me about it and I've always wanted to go, so this is the year I'm going to start! This conference also has an online streaming option (how cool is that!) but I'm going to be attending in person. I'm looking forward to learning more about writing and connecting with other local writers and people who are interested in writing and promoting children's literature. Although meeting new people makes me a little nervous, I like going to writing workshops and conferences because they always inspire me with new ideas or perspectives on my latest writing projects. Since I've recently finished a big novel revision, I'm starting a new project, so this is a perfect time to kick start my imagination. What will inspire your writing this weekend? Today is Remembrance Day. It's a day to think about the past and those who fought, the present and those who continue to fight, and the future and our dreams for peace. I haven't done a post about podcasts in while, but that doesn't mean I've stopped listening! I've been struggling to get past a difficult place in my writing, which I think is mostly due to interference from my own insecurities. So it was great to hear other writers talking about these and how they manage to carry on with their writing in spite of them. Even though I don't usually think too much about how I get into the "creative zone" when I'm writing (I just cross my fingers that I somehow manage to get there in the hour or two I have before work), I found it useful to think about my work patterns and when I'm most productive. I was interested in the idea that everyone has times of the day and times of the year when they are more creative or more stressed, and the thought of planning around that made a lot of sense. I love hearing popular authors of YA and MG fiction talk about their work, and this conversation was so interesting! It really does help to hear that well-known published authors struggle with their insecurities too. If you haven't heard Sara Zarr's podcasts, they are worth checking out. She asks good questions that invite a lot of discussion in a low-key, conversational format. I hadn't thought much about this distinction before. I especially liked their discussion about editing-while-writing because this is something I tend to do a lot of, and at times it can lead me totally rewrite a large section before I move on because I just don't like it and can't continue with the story until it's better. This was an emotional story filled with realistic characters. I could really connect with Jakob and how the dog helped him through his grief and sadness over losing his parents. I was rooting for Jakob to get through his difficulties and find out who he could care about and rely on. At the same time, I was glad that the book didn’t have a totally wrapped up ending with everything resolved. I had a sense that the characters live on and continue to work on their problems. 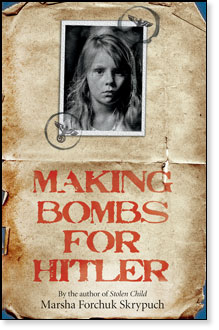 I think both boys and girls would enjoy this book. As a writer, I’d look at this novel again to see how the author created a strong first person voice for Jakob. Jakob's adventures with the dog kept the story from feeling too sad, but at the same time worked well to show how Jakob learned to deal with his feelings. 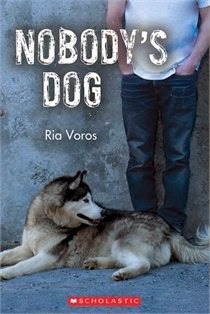 For more info, visit Ria Voros’ website. Learning from Picture Books: Crankenstein! The concept of this book is one all kids can connect with! I loved the voice in this story and admired how so much was conveyed in just a few words. 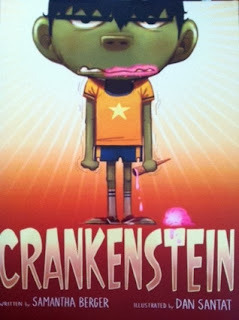 The illustrations complement the story so well – I loved the expressions on Crankenstein’s face. I also liked the way the book was structured, with repetition in sets of 3s, just enough to entertain without being monotonous for an adult during a read aloud. The ending was cute. This is another example of how a good concept is important in creating a picture book. This book would be a nice one to read around Hallowe’en or in comparison with other monster books. I’d use it to start a discussion about feelings and what makes you feel grumpy, and expand the discussion to talk about what to do when you feel grumpy. You could also encourage students to write about their own “Crankenstein” stories or moments. The edition I borrowed from my public library had funny labeled diagrams of Crankenstein on the front and back covers. These would be a great model for a fun activity where students draw themselves as a Crankenstein and make up their own labels. For other great picture books to read, check out Perfect Picture Book Friday, using #PPBF on Twitter, or visit Susanna Leonard Hill's blog for a list of bloggers who are blogging about picture books today! Did you know it's Picture Book Month? Every day in November, a picture book champion explains why he/she thinks picture books are important. It's also PiBoIdMo (aka Picture Book Idea Month), where picture book writers try to come up with 30 ideas in 30 days. I'm excited to try the challenge!